SHINE Medical Technologies has received approval from the Nuclear Regulatory Commission (NRC) to begin constructing a plant in Janesville, Wisconsin, to make a medical isotope needed in about 20 million procedures annually in the United States. The permit is the latest sign of success in a 20-year quest to make molybdenum-99, an isotope that quickly decays into a form of technetium-99 that is used in SPECT scans, which can detect cancer and assess blood supply to the heart. The University of Wisconsin-Madison spinoff's Janesville plant is slated to employ around 150 people when it opens in about three years. SHINE CEO Greg Piefer pioneered the technology that the facility will use while getting a Ph.D. from UW-Madison’s nuclear engineering program. SHINE expects that more than 1 billion patients will benefit from its technology. "This kind of progress is a perfect example of why this university is such an economic engine for the state," says UW–Madison Chancellor Rebecca Blank. "SHINE's discoveries and inventions will have a substantial impact on human health, and the plant will be a substantial asset to Janesville and Rock County. I can't say it enough: These are discoveries that can only take place at a world-class research university like UW-Madison." The NRC's construction permit represents the first time since 1961 that the federal government has issued a permit for a facility to make these medical isotopes, says Piefer. “We’ve developed a greener, safer and cheaper way to produce these life-saving isotopes on a global scale. We want to ensure that there will be a reliable supply of medical isotopes long into the future for the millions of patients that rely on them. For decades, the federal government has supported the search for an alternative source for molybdenum-99, or moly-99. Today, the isotope comes from highly enriched uranium, which can be used in nuclear weapons. In 2008, Canada announced plans to shutter the reactor it was using to make moly-99, closing off a significant fraction of the U.S. supply. With the valuable moly-99 market in play, Piefer opened SHINE in 2010 and began planning a safe, profitable and proliferation-proof method to make the necessary isotope. SHINE's technology will rely on the world's most powerful commercial neutron accelerators, which are made by Piefer's previous startup, Phoenix Nuclear Labs. Phoenix and SHINE are both based near Madison, in Monona, Wisconsin. The Phoenix accelerators create a small fusion reaction, which releases a cloud of neutrons that, in turn, produce moly-99 by the fission of a uranium-based compound. 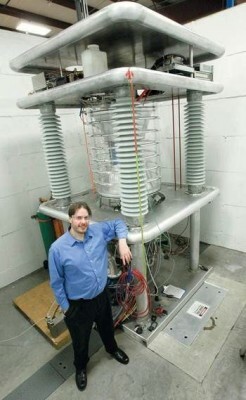 Piefer credits Gerald Kulcinski, leader of the UW's fusion program, for inspiring both technologies. "Jerry suggested that fusion could be used to create neutrons that can transform isotopes. Theoretically, nuclear fusion could supply vast amounts of clean electricity. Because that goal remains elusive, in the 1990s Jerry steered his students toward profitable, near-term applications of fusion, such as making moly-99." Even with the NRC permit in hand, SHINE still needs multiple state and local permits, Piefer says. "The issuance of the construction permit is their way of saying, 'We understand the risk, and think you have appropriately mitigated that risk.'" While previous factories that made moly-99 relied on highly enriched uranium that could be diverted to weapons, SHINE will use only low-enriched uranium, which cannot be used to make bombs. The radiation used to transform the isotopes can be turned off almost instantly by shutting down the electric supply to the accelerators, Piefer says. Before the plant goes into operation, SHINE will require an operating permit from the NRC, Piefer says. "To get that permit, we'll have to verify that we built what we said we would build, and that the equipment operates as we said." Site, access and safety are all paramount concerns for SHINE, and Piefer says he's found an ideal site on the south side of Janesville. "The soil is stable," he says. "It's far from seismic activity and has a fairly deep water table." Because moly-99 decays at the rate of 1 percent per hour, rapid air travel is a must to get it to customers. The Southern Wisconsin Regional Airport is adjacent to SHINE's proposed site, and O'Hare International Airport is only two hours by road. "Greg and his team have made every effort to communicate factual information about the project and the product, the science behind it, and the regulatory process," says John Beckord, president of the economic development organization Forward Janesville.